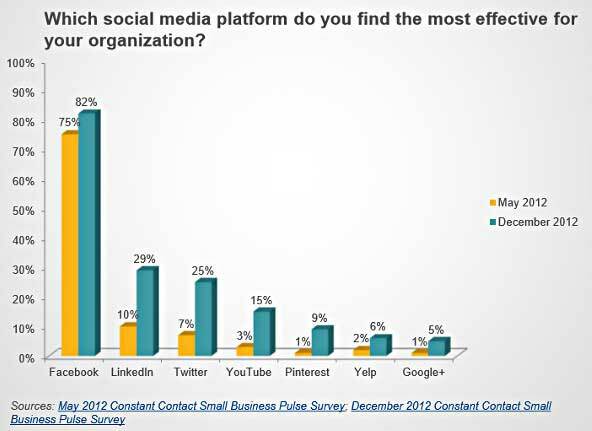 Despite much debate over the value of social networks to small business marketing, growing numbers of small business owners view social media as an effective tool, according to a survey from Constant Contact. Surveyed small businesses report the biggest surge in the effectiveness of LinkedIn and Twitter, among the major social networks. 82% say Facebook is effective for their business, up 7 percentage points (PPs) from the 75% who said so in May 2012. 29% say LinkedIn is effective, up 19 PPs from the 10% who said so in May. 25% say Twitter is effective, up 18 PPs from the 7% who said so in May. 15% say YouTube is effective, up 12 PPs from the 3% who said so in May. Among small business owners, Pinterest (9%), Yelp (6%), and Google+ (5%) rank lower in business effectiveness.